I saw this on another site concerning the new 1.3 million dollar Visitor Center in Yosemite that opened up April 13, 2007. Someone posted this on this blog. Well here is no denying discrimination towards Paiutes in Yosemite, here is the proof, and it is really bad. Some Paiutes went and checked out the new Yosemite Visitor Center and NOT ONE Paiute was identified as a Paiute. Alot of them didn't have names either. It is really disrespectful. A couple of Paiute elders went to the newly remodeled Yosemite National Park Visitor Center and found something very interesting. What caught their eye was not what was written, but WHAT WAS NOT WRITTEN and identified. The odd omission that leads people to assume something that is really unknown. The new Yosemite National Park Visitor Center was partially funded by the Yosemite Fund. We would hope that Yosemite National Park Service would get the story of the Native American people of Yosemite correct, instead they have done the opposite. A Miwok legend, showing Native people living in Yosemite. They completely forgot the story of Chief Tenaya being born at Mono Lake of a Paiute mother and being married to Paiute woman before entering Yosemite and estabishing the Paiute colony of Ahwahnee. In the drawing of whites burning the acorn caches they left out the Miwok scouts and guides that helped the Mariposa Battalion locate the Ahwahnee camp, that is documented. Next is a photo of Captain Paul or Saponanche, which in Paiute means someone who is part Mexican. He lived around the town of Coulterville and had a daughter named Julia. He was not the father of Mono Mary as has been falsely written. The next photo is the series is of Mary Lebrado Yrdte. She was married to Mexican miner in the area and had several children. She admits she had not visited Yosemite Valley in 75 years until around 1928 a couple of years before her death. 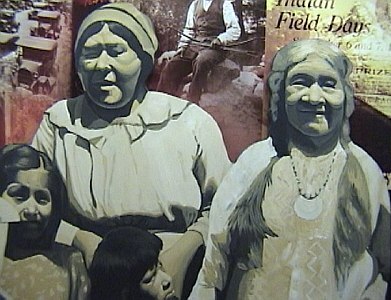 Maria Yrdte claimed to be the granddaughter of Chief Tenaya. If Maria was the granddaugther of Chief Tenaya she would have to be documented half Paiute from his side. Here is why. Tenaya's father was from a tribe unlike any surrounding tribe, that would include Miwoks, and his mother was a Mono Lake Paiute. Tenaya was born at Mono Lake and raised amongst his Paiute mothers people til he was was old enough to marry. Later in life he married a Mono Lake Paiute woman and had children. LATER a medicine man advised Tenaya it was safe to return to Yosemite Valley where took 200 to 300 people from Mono Lake back into Yosemite and there established the PAIUTE colony of Ahwahnee. Tenaya also spoke Paiute. The photo does not have any information of Maria Lebrados famous Paiute grandfathers past. The next photos in the series at the Yosemite Visitor Center were in a group, and this is what Paiute people have a dispute with this exhibition. Where is the tribal indentification of the photos and sometimes the names are missing, yet the Indian people in the photos are known? the photo has no title or tribal identification in the new Visitor Center, but the photo is called Piute squaw, Yo-Semite, ca 1875 by J. P. Soule. The photo is of a Paiute Laundress in Yosemite Valley, ca 1875, capturing Yosemite Native American life. In the Visitor Center there is no tribal identification. The photo is of Mono Lake Paiutes Bridgeport Tom and his two wives Leanna and Louisa in Yosemite Valley. They are Yosemite Mono Lake Paiute Native American indians. Who spent most of their lives in Yosemite and Mono Lake. Even though they are identified as the Toms, there is no tribal identification. 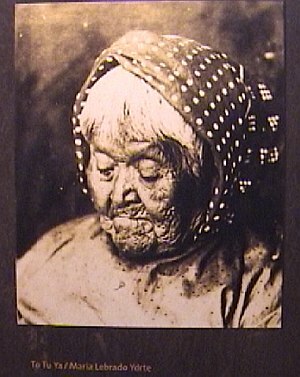 The photo is of Calepena or Callepina, which is Spanish for half-breed and Lena Rube-Brown-Wilson. Calepena was married to one of the Mono Paiute Captain Johns and Lena was a Chuchansi Yokut, Washo-Paiute woman. The next picture not shown here, was a photo of family grouping which was identified incorrectly years ago. 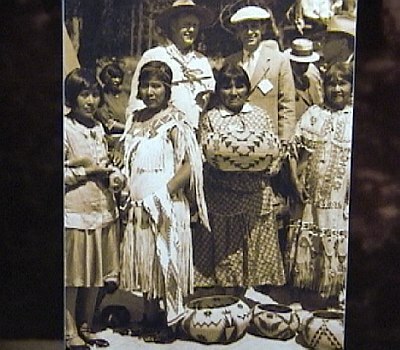 Early Yosemite Native American California basketry demonstrator Maggie "Tabuce" or "Taboosee" Howard and her family. They are a full blooded Yosemite Mono Lake Paiute American Indian family who lived in both Yosemite and Mono Lake. They are unidentified with name and no mention of the Paiute tribe. 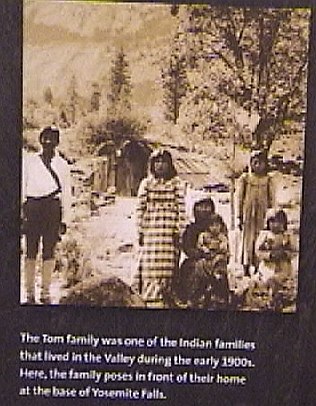 Photo behind Tabuce and family is picture of Tom Hutchings, Mono Paiute, Yosemite National Park's first mailman. Yosemite National Park has markers in the park with Tom Hutchings identified as a Miwok, THAT IS INCORRECT. 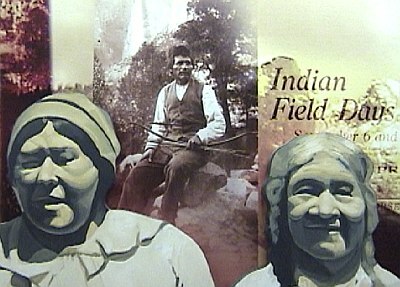 These Paiutes are not identified in the newly created Visitor Center, yet they are very well known to many people. The notice on the right of Tom Hutchings and behind Taboose's head is a notice to the Indians in the Yosemite area. The notice states that if Indians 'dressed up' in Plain outfits they would be paid and given phony titles. 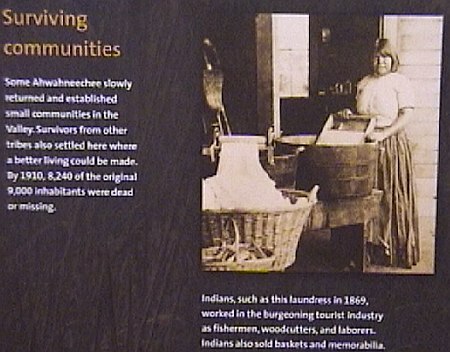 This was for the pleasure of the Yosemite white tourists, many Paiutes declined. Captain Sam, FULL BLOODED YOSEMITE MONO LAKE PAIUTE. Father of many Mono Lake and Yosemite Native Americans. Many of his children and grandchildren were some of the most famous Yosemite Indian basket makers. He was married to Paiute Susie Sam who died in August of 1903. You can see two of his daughter's Louisa and Leanna who were married to Bridgeport Tom in the Tom family photo. His photo is unidentified and has no tribal affiliation of Paiute. The next photo is of Yosemite Indian Field Days, with the winners of the Yosemite Native American basket makers, which were always Yosemite Mono Lake Paiutes, many of them from Mono Lake not Mariposa. Once again they are not identified. The Yosemite Mono Paiutes in the photo are from left to right; Carrie Bethel, Alice Wilson, Leanna Tom, and Maggie Taboosee Howard, all Paiute women. 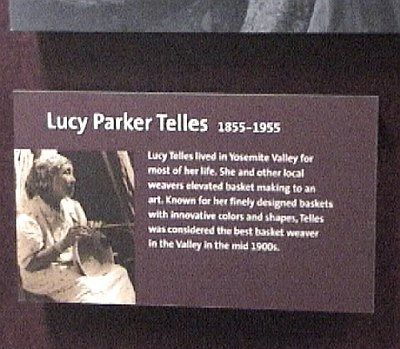 Those huge beautiful baskets in Yosemite National Park Indian Museum were mainly made by full blooded Yosemite Mono Lake Paiute Indian women. Yet you would not know that by viewing this exhibit. 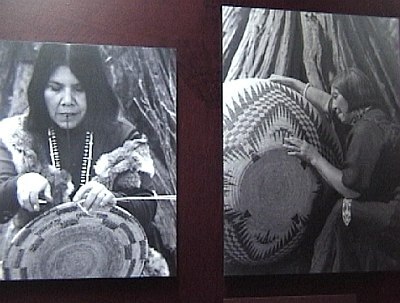 Yosemite Visitor Center exhibit of Indian basketmakers. Yosemite Mono Lake Indian basket maker Minnie Mike, full blooded Paiute. Yet she is unidentified. Lucy Parker Telles, IS indentified. 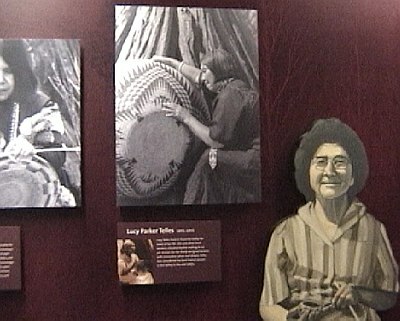 She is a famous Yosemite Mono Lake basket maker. 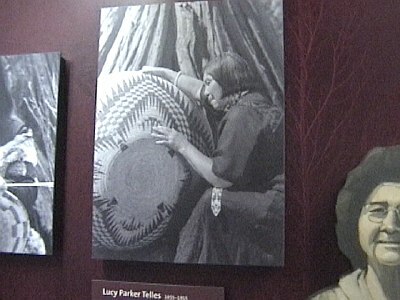 Interestingly Lucy Parker Telles is identified, but not were she was born or her tribal identification. 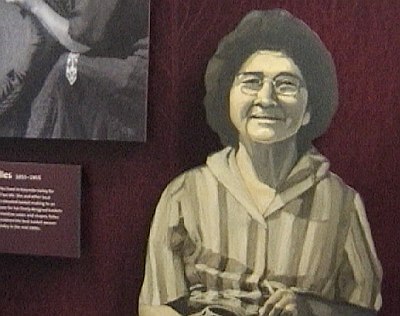 Lucy Parker Telles was born at Mono Lake and is a Paiute. Then again she is Julia Domingues Parker's mother-in-law. So they put her name, but not her tribe. Just to the left of Lucy Telles is Julia Domingues Parker who now works in Yosemite National Park. 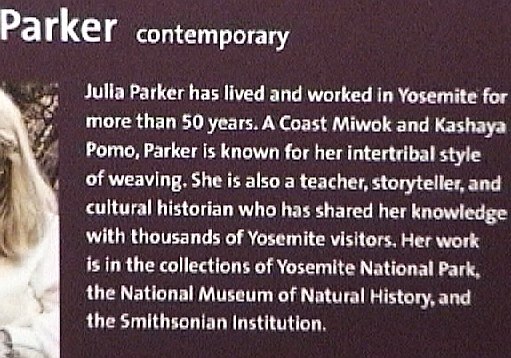 Not only is Julia Parker identified but so is her tribe. In previous years Julia was known as a half Pomo on her moms side and half Mexican on her fathers side, now she is a "Miwok"? Of all the people in the exhibit her tribe is identified and so is her name. Meanwhile all the others who have ancestral ties to Yosemite and the area are not? Interesting for an exhibit about Yosemite Indian people. Captain John did not have any identification as a Mono Lake Paiute Chief and one of the historical chiefs of Yosemite. He distrusted white people and told his people not to fight in their wars. He took control of the Yosemite Mono Lake Paiute people as a very young teen and was reported to have killed Chief Tenaya for his betrayal to his own brethren. He was not only a chief but a powerul medicine man. 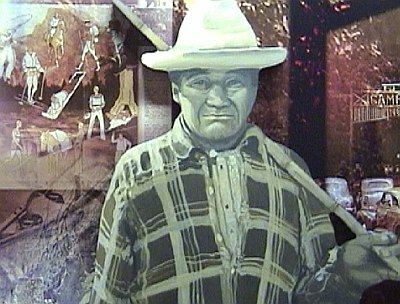 In the newly remodeled Yosemite National Park Visitor center he is just some unknown Indian, but to us Paiutes, he is one of the greatest men in our history, the history of Yosemite and Mono Lake Paiute Indian people. Right before they left they saw a little video on the wall of 19 year old "Annual Indian Trek". This "trek" was created about 19 years ago to prove to the BIA's Branch of Federal Acknowledgement that the no-profit "Southern Sierra Miwuks" had an annual celebration, but this Annual Trek was started by a Mono Lake Paiute. Now here is something that is really funny about this "Annual Trek", if they are Southern Sierra Miwuks why are they walking to PAIUTE MONO LAKE from Yosemite Valley? Why aren't they 'treking' to Mariposa or Sonora or Calaveras if they are Miwoks? Why use OUR Mono Paiute Trails to do YOUR Annual walk and trek if you are not Paiutes? That is the way we Mono Paiutes used to enter Yosemite and not the trails Miwoks used. It was never recorded that Miwoks went in groups to Mono Lake, only Tenaya's Mono Paiute band of Ahwahnees. During that time Paiutes and Miwoks were fighting. Here is why we believe that there was NO TRIBAL IDENTIFICATION in the Yosemite National Park's new Visitor Center. First is starts out with a Miwok legend and if you don't indentify the Indian people, many people, who do not know, would ASSUME that the rest of the photos were of MIWOK PEOPLE when you start with a Miwok legend. Why is only one person identified with name and tribal identification, yet she is not a Yosemite Indian? Why aren't the majority of the Indians identified and why do NONE OF THEM HAVE PAIUTE on them??? So if you were to visit the new Yosemite NPS visitor center you would be fooled to think that you were viewing a bunch of Miwok people, when in fact the faces staring back at you are mainly Yosemite-Mono Lake PAIUTES. on emails many of the family members of those Paiutes in the pictures sent complaints to Yosemite National Park Service staff...and not one reply...nothing. 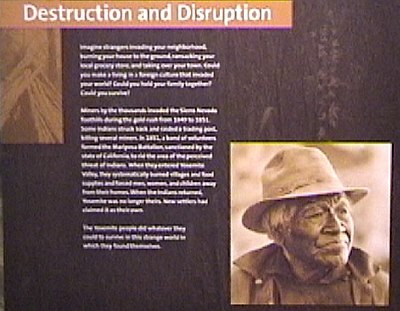 Yosemite National Park Service is putting this exhibit up and NOT giving credit to the Native Americans of Yosemite by telling people they are Paiutes. They are just nameless Indian faces to them, but to us they are our family members and Paiutes. 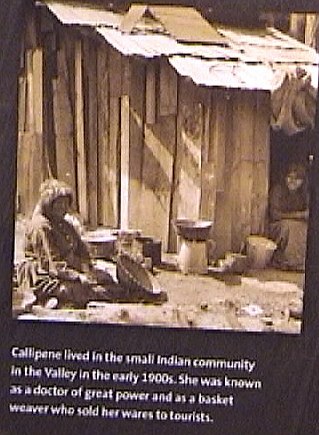 What the families thought was weird was that the only non-Yosemite Indian has her tribe and her name in the exhibit? Thanks for the thorough critique on the new Yosemite Visitor Center exhibits, and the corrections and supplemental information! In general, I think the exhibit was a lot better than what they had before, at least in the area of natural history. In Yosemite Indian history, however, it seems to be another matter. 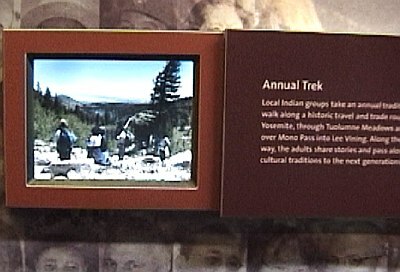 It's too bad they didn't properly identify the individual Yosemite Indians in the exhibit. And it's especially a shame they neglected a whole tribal group that obviously had a major role in Yosemite history, the Mono Lake Paiutes. 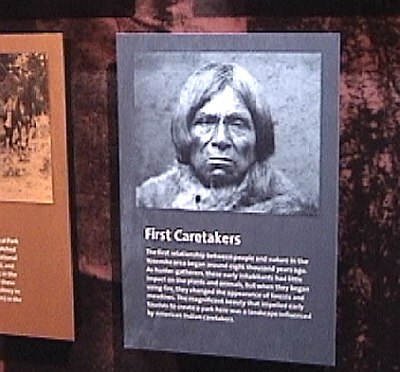 At the very least, the Park Service could pay proper respect and identify the Yosemite Indians pictured or painted in the exhibit, by name and tribal affiliation. The one I noticed, before I saw this posting, was Captain John who is pictured toward the end of the exhibit and identified only as one of the "First Caretakers," while adjacent people on that panel are completely identified.